"Glad to meet you! Let's get down to business and have an interview!" Then you slide that baby across the desk. "Here are all the questions you're going to ask me... and the answers! Now you've got them, and I've got them, and we don't need to waste our time on them. Now we can do something useful, and talk about the work you need to have done!" Instead of teaching job candidates to talk shop with the hiring manager, "career experts" outdo themselves rehashing and regurgitating those silly "Top Interview Questions." The silly answers they offer are rehashed and marinated in expired creative juices, and about as satisfying as a bolus coughed up by the last person who interviewed with the manager. Back in 2003, the editors of FastCompany magazine put together a cover story titled, "All The Right Moves: A guide for the perplexed exec." It was a collection of 21 Q&As for managers. Editor Bill Breen asked me to write a "memo" to managers about Question #16: What is the single best interview question ever — and the best answer? Here's the memo I sent to Breen. I think you can toss out every list of Top Stupid Interview Questions, whether it includes 50, 200, or 2,800, and just ask the one interview question I discuss in my memo, which is reprinted below. The purpose of any interview is simple: to determine whether the candidate can do the job profitably. A smart interview is not an interrogation. It's not a series of canned questions or a set of scripted tests that have been ginned up by HR. An interview should be a roll-up-your-sleeves, hands-on meeting between you and the candidate, where all of the focus is on the job. "What's your business plan for doing this job?" "We want you to show us how you're going to do this job. That's going to take a lot of homework. I suggest that you read through these 10 pages on our Web site, review these publications from our marketing and investor-relations departments, and speak with these three people on my team. When you're done, you should have something useful to tell us." This will eliminate 9 out of 10 candidates. Only those who really want the job will put in the effort to research the job. "Would you like me to show how your company will profit from hiring me?" The candidate should be prepared to do the job in the interview. That means walking up to the whiteboard and outlining the steps that he or she would take to solve your company's problems. The numbers don't have to be right, but the candidate should be able to defend them intelligently. If the candidate demonstrates an understanding of your culture and competitors -- and lays out a plan of attack for solving your problems and adding something to your bottom line -- you have some awfully compelling reasons to make the hire. But if you trust only a candidate's past accomplishments, references, credentials, or test results, you still won't know whether the candidate can do the job profitably. Recruiting is still -- and always has been -- about finding the best candidates. But the best candidate isn't the one who can answer that question. The best candidate is the person who brings it up and volunteers to answer it -- and is ready to show you how he or she will do the job profitably. How Can I Change Careers? picks up where that FastCompany column leaves off. And it's not just for career changers. It's for anyone who wants to stand out in the job interview. The book explains why this "single best interview question ever" for hiring managers is also the single best question for candidates to bring up in the interview. 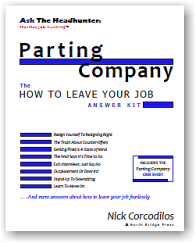 Find out why Fast Company says it's "chock full of tips for the thorniest of job-hunting problems." Learn more about How Can I Change Careers? Have a Cup O' Joe With The Headhunter ! Wish you could have a cup of coffee once a week with The Headhunter -- for help in getting an edge on your career? Want more great tips about job hunting, interviewing, and hiring?